Xenoblade Chronicles X is one of the most intricate JRPGs I've played in quite some time. I even ended up taking notes on a real notepad for it on a few occasions! Here are some tips to help kickstart your adventure. This goes first and foremost. Read. The. Manual. Read it! While we've been conditioned to ignore basically everything that isn't force-fed to us in-game, the manual will help you immensely when it comes to reading the map, and pretty much everything else. Everything will go so much smoother if you read it. Return to Eleonara periodically to see if you can upgrade your excavating capabilities. She's located right in front of the main console in New LA. Again, reading the manual will let you know which icons mean what on your GamePad map, which will inform you of when you have a New LA reward waiting. If you're going to err on one of the three choices, go for Mechanical so you can get more mining probes set up. Pick up a ton of quests, as there's no downside. 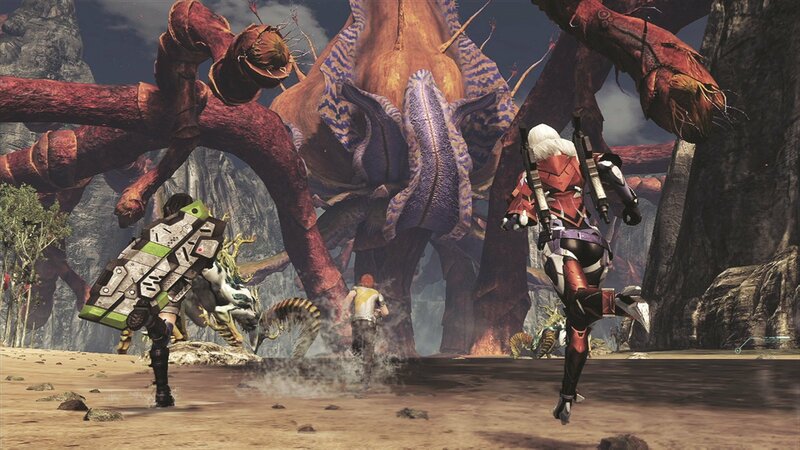 Wandering around is the biggest source of enjoyment in Xenoblade Chronicles X, so you may as well take a handful of quests while you're roaming around. Often times you'll randomly find objectives out in the wild. If you're getting confused combat-wise, try to split your abilities on your hotbar to ranged and melee on each side. Personally, I go ranged on the left and melee on the right, as my character is melee-centric. It'll help you manage your constant weapon switching much easier. Bunny hop and force your way up hills -- you can traverse so much ground this way. Always stay sprinting, as hitting a wall or object will not stop your sprint. Equip your team every five levels or so from the New LA shop if you haven't acquired superior gear. Most people will probably forget to load out and upgrade every slot, but beyond that, you can socket items! Do not overlook this, as the bonuses involved can get you over that boss fight slump you're experiencing. When you get the "Follow Ball," a few chapters in, don't forget that it exists. I ended up not using it all the way up to Chapter 10, and it would have saved me some time navigating to different quests. Always try to bring an HP ability to a fight. If your character dies and doesn't get resurrected, it's game over. Sure Xenoblade Chronicles X will simply revert to the nearest zone instantly, but you want to avoid that frustration as much as possible on your core avatar. After failing on a boss several times, you can lower the level of it for the current mission. This is another option if you need that small boost to win. Speaking of bosses, Prep your TP for a boss fight if you're going into the encounter after a death. That way you'll start prepared. Notice the little icons near some of your abilities? They denote whether or not they cost or provide TP after use. Learn which ability does what. You can fast travel almost anywhere, not just to nodes. Swap through the views on your GamePad map and click anything with an orange icon. Hire people if you're having issues with a mission or boss! If you're so close every fight, like within an inch of victory on that enemy health meter, hire someone at or above your level to jump in and tip the scales. You can hire people out in the world, in the barracks, or on the PC screen near the main mission area (I recommend the latter zone as it offers up a ton of options).